The author of this part of the book of Isaiah is no longer in exile in Babylon but is living in Palestine. In this text the author interprets the return of the exiles not merely as good news for the nation of Israel but as an event of universal proportion. This is quite a hopeful declaration given the fact that this ragtag collection of exiles has nothing but ruins and faith. Paul writes to the Ephesians from prison. You might think that his dire predicament might temper his outlook. You would be wrong. For Paul, nothing happens, good or bad, that does not in some way further God’s plan for humanity. And what plan is that? That in Christ all people will be united–Jews and Gentiles. Paul is hopeful, but not necessarily optimistic. Optimism is the conviction that, sooner or later, things will turn out all right. It is founded in the belief that eventually all the wrongs will be balanced out by good. Hope, according to Paul, is the strength of conviction that enables us to risk it all on God’s promise in spite of the overwhelming evidence to the contrary. There is a bit of folk-wisdom that sums up the story of the astrologers in today’s gospel. 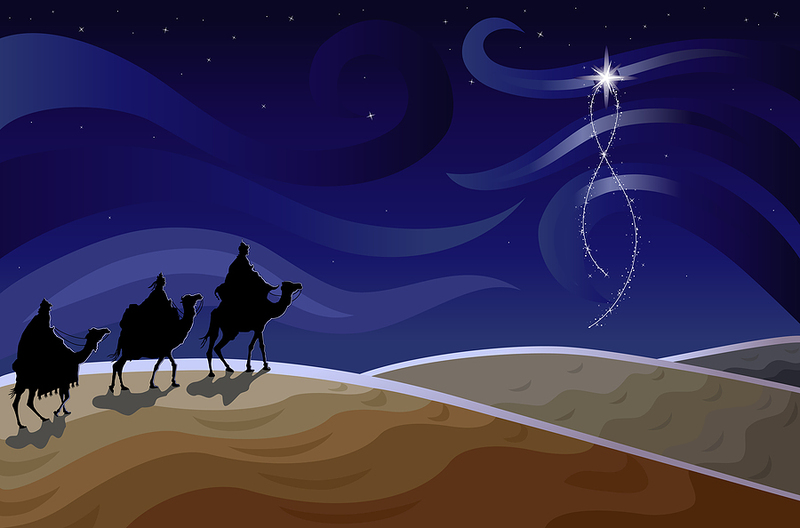 “Those whose eyes are always cast towards the ground will never see the stars.” Why is it that these foreign astrologers looked at the night sky and saw signs and wonders, but the wise men in the royal court of Herod saw only stars? Why was it that the astrologers pondered the meaning of this celestial event, but Herod plotted political intrigue? The astrologers were open to seeing something new. They brought their curiosity and desire for wisdom with them as they searched the skies. Herod’s gaze was fixed on his own closed world. His world was too small for the signs and wonders God was revealing. And when confronted with the possibility of the in-breaking of God’s promise that did not fit into his worldview, he was only concerned with protecting what he had. Where are our eyes cast? What are we searching for? What are we willing to let go of to see God’s signs and wonders? * This reflection is from Advent 2000: Seeing Signs and Wonders.